Kamari is a significant tourist resort of Santorini near the airport on the east side of the island with loads of green with eucalypt and tamarisk trees and vast sandy beach with black pebbles. 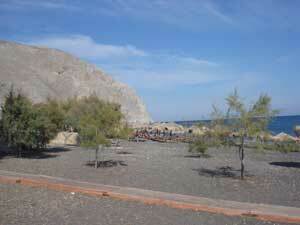 Just over Kamari is the archaeological site of Ancient Thira, on Mesa Vouno. You can enjoy swim in the beautiful beach that is stretching up until Monolithos. The sea is ideal for windsurfing. You will find hotels, rooms and campsites, and along the beach there are restaurants, cafes, bars, discos and clubs with Greek music, shopping malls, bakeries, supermarkets, ATMs and a Medical Center. The best nights of Kamari is the nights following the full moon, the moon rises red from the sea and the beach bars and beach fill from tourists with cameras to capture the unique spectacle. From Kamari start excursion boats toward the neighbouring island of Anafi. Nissia Apartments its a wondrful complex of apartments right at the sea front of Kamari beach with excellent sea views and the colourful sunrises. The Nissia Apartments, at Kamari of Santorini, offers swimming pool, Jacuzzi and apartments all equipped for self catering , including fridge, small kitchen and air conditioning. In this complex, visitors can choose from a variety of accommodations like spacious apartments with lounge and maisonettes with second bedroom upstairs or traditional studios with living room. 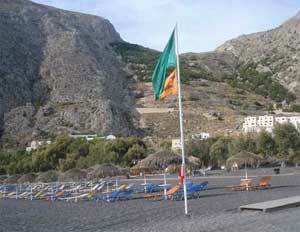 The Tamarix Del Mar located a short walk from the beautiful beach of Kamari in Santorini. It is a beautiful and pleasant hotel, its facilities include indoor and outdoor swimming pool, Jacuzzi, gym, restaurant and playground. The staff of the hotel provides excellent service. The Tamarix Del Mar hotel offers modern amenities without losing its traditional Greek atmosphere. Each suite is unique and warm with beautiful decor. The hotel is near to the Airport (4 km about) there is a bus stop and a supermarket near by.